Forget things going bump in the night. They bolt right out of doors here! Every evening, Heather and Mr. K go on their fourth and final walk for the day between 10:30 - 11 p.m. The other night was just like any other, except for the new neighbor across the hall who came out simultaneously, said hello and commented on how cute my puppies were. We then headed in separate directions - she to the trash chute, Scottie Dad and I to the elevators - when I hear her say, "oh, crap." I turned to make sure everything was okay and, to my horror, I see a rottie mix coming toward us. Now, for those of you who've followed Mr. K's adventures, you know he has a history with rotties that (quite literally) once left him hanging from a not-so-friendly Rottweiler's mouth. So, you can imagine how I felt when I saw one trotting toward us. As luck would have it, I turned to see the rottie - who actually looked quite friendly, although you'd never know it by the temper tantrum Mr. K was throwing - and saw a second rottie mix come bounding out of the apartment and the nice new neighbor of mine taking her sweet time walking toward us, saying they're harmless and probably want to play. Finally, the new neighbor came for her dogs, apologized and I was able to continue on toward the elevator. I was so shaken up by that experience though. All it takes is for one bite and Mr. K could be out of luck, right then and there. And the simple thought of having to put him down after everything we've been through is enough to make me sick. People laugh when I tell them that neither of my dogs are particularly friendly with other dogs. They always say something sarcastic like, "yeah, they look like real killers." What's more, so many of them continute to walk with their dogs off leash, including these two rottie mixes that have just moved in. Another neighbor of mine was waiting for the elevator the other morning with his dog. She's not too friendly either, but she graciously allows Mr. K and Heather to join her in the elevator if her dad picks her up. So, there they are, waiting patiently when the elevator door opens and the two rotties come bounding out of the elevator, knocking my 6'2" neighbor on his back and leaving his dog terrorized. The rottie mix owner apologized but was later seen that day escorting the rotties through the lobby (a big "no-no" according to this building's HOA) off-leash. Moral of the story (and I may be speaking to the choir on this one, Scottie Moms and Dads): keep your pets on leash and be considerate of those who may not have an overly friendly pup! Everyone is safer that way and it certainly would save this Scottie Mom from suffering an early heart attack, that's for sure. I 100% know the feeling. 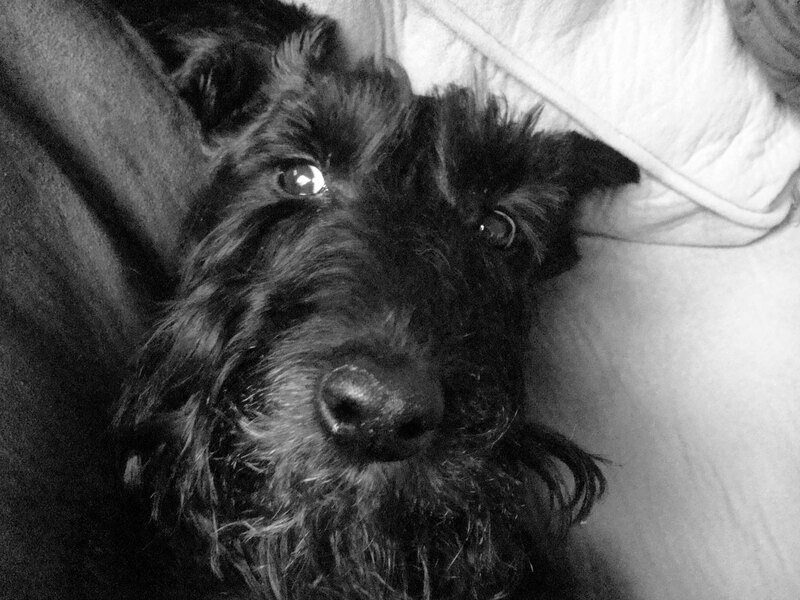 Our scottie Finnegan had an awful run in with a mean dog that left Finn missing a chunk of his back end. Every since then he is super growly and scared when strange dogs come around. It makes me nervous even to take him for walks because so many people in our neighborhood walk their dogs off leash. All it takes is one scared bite and its Finn in trouble. From one scottie mom to another I know the terrified feeling! Best of luck with the new neighbors! I absolutely hate when people have their dogs off leash. For their own safety they should keep their dogs on leash. I will do what I have to do to protect my dogs, and I'd hate to have to hurt a dog protecting mine because their humans are irresponsible. Wow. I feel your pain Scottie Mom. This is a trying situation at best. Now that the hair on my neck is lying flat again, may I suggest the lesser of all evils. Make a friend of the Rotties. Schedule a (strongly) supervised play-date or at least a social-mix, so the kids know one another outside the 'hallway'. Of course you know that you must have a 'chat' with Rottie Mom also. This may save you on Cardiologist bills, and possibly psychotherapy. Your situation, as is, would be waaaay too stressful for me. I get the heebie-jeebies just imagining that elevator door opening to ?????? You're a smarty, you'll find a way to live with peace. I am certain of this. Best to you--and the kids. Fyi-the jaw & teeth of a scottie is as large as any large sized dog...just sayin! Haggis and Lucy loved our darling Winifrid (a Rottie) who passed away 6 weeks ago, BUT she was a gentle old soul that also tolerated my two Bulldogs. I would NEVER trust any strange big or small dogs (Rotties or whatever) around the puppies, because Haggis thinks he is the Chuck Norris of dogs. Lucy is a sweetheart and wants to be friends with everybody, which is very scary as she will go right up to a strange dog and say hello, let's play. We live in South Africa so we have lots of space to let the dogs run free on walks, but as soon as there are people/dogs around they are back on the leashes. Have a word with your new neighbour about leashing her dogs or not allow the Rotties to bolt every time she opens her front door. We cannot agree more! We live in a townhouse complex and the rules clearly state that all dogs must be on a leash when out on the common property. We cannot tell you how many times we've been out on a walk and there are dogs running around off leash. I get really angry and make my boys sit and insist that the other dogs either get picked up immediately and taken away or put on leash. I am not very popular in our complex for this but I cannot care less - my dogs safety comes first. Indy is not friendly with man or beast and extremely territorial; Lucy loves everybody. We understand your fear....in fact, Maggie was a pet store puppy and completely terrorized for the 3 (yes, 3! )months she was there. Others dogs and probably humans scared her into a fear-aggressive stance whenever we encounter other dogs. It is very hard for her...and it is a million times worse when an unleashed dog comes upon her when she is tethered to her mom. She feels completely out of control. Owners need to be responsible for their pets. Period.